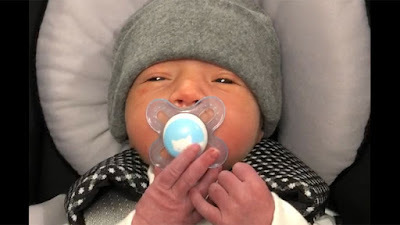 Kade Smith is only a few days old, and he has already figured out how to place his hands on his pacifier to hold it in! UPtv just posted a 20-second video of the little man showing off his new skill. You can view it below. Sounds like Tori saying "how adorable" on the video. Yes he is adorable. Enjoy your baby they grow up way too fast. I have the same kind of video of mine when she is a few days old! Might just be a coincidence that babies do that, but it sure is cute. He's so smart, figuring out already how to keep his soother in. Awwww, adorable for sure!!!! And this is why babies shouldn’t wear mittens 24/7. Glad to see Tori not restricting Kade’s tactile stimulation and fine motor skills. Hey he is super cute, and smart too!!!!!!!!!!!! !